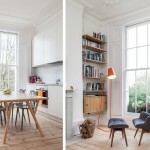 This project is a renovation of a small (38sqm) flat within a listed building in Islington, North London. 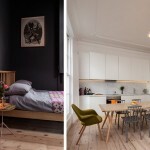 The flat was originally a studio with a bed-sitting room and separate kitchen. 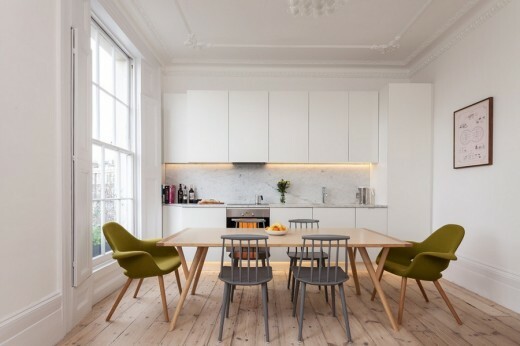 The kitchen was relocated to create an open plan kitchen-diner, allowing the flat to have a separate bedroom. 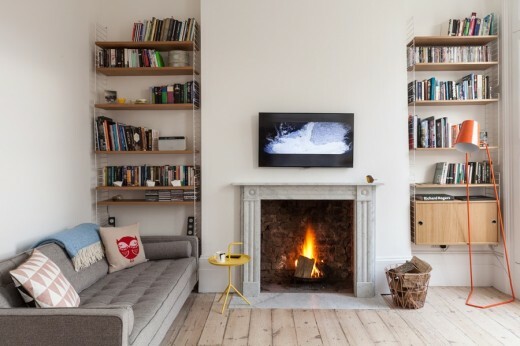 The works therefore enabled the fat to become a more usable 1-bed property. The property was built in 1862, and is part of a Grade 2 listed crescent. Unusually, the crescent provides a wider plan at the rear of the property, this allowed more generous proportions in the new bedroom to the rear of the flat. The property was purchased at auction from a housing association, and prior to the works had worn lino floors, asbestos flues and bricked-up original fireplaces. Low quality hollow doors were replaced with solid panelled doors and new architraves throughout, as required by the listed building consent. 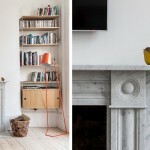 New fire surrounds, kitchen surfaces and floor thresholds were specified in carrara marble. Decorative cornices were repaired, with 150 years of paint layers stripped back to reveal original plasterwork. The floorboards were exposed, repaired and sanded, prior to treatment with a swedish white soap stain. 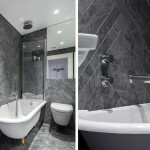 A herringbone slate tiled bathroom features heated fog-free mirrors and a roll top bath with bespoke yellow feet. The bedroom walls, ceiling, skirting and architraves were all finished in a matte Farrow and Ball ‘off black’, with the cupboard doors in grey tinted mirror to complete the dark palette.